If you subscribe to our Constant Contact email news, you are already aware that we brought back our popular SPECIAL OFFER – DESIGN OF THE MONTH. In March we featured ANATOLIA. In April it was MOROCCO STRIPE, and in May CELTIC KNOT. This month it’s GAME BOARD in 5 different color choices in 2 different sizes. On the cross-point online website, you will find a listing of companion pillows that are related in color. Game Board is a simple, easy to stitch pattern, both modern yet historic in its design. Suitable for all levels of stitching, from easy to experienced, it is a pattern that mixes well with more elaborate designs as can be seen on our website. The regular price for the large size is $119.00 but with the DOM price it’s only $95.20, and the small size is regularly $69.00, and only $55.20 during June. 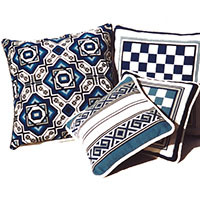 This entry was posted in Blue & White colors for summer stitching, Summer and tagged About cross-point, blue & ocean colors, blue & white pillows, color schemes for stitching, cross stitch kits, Design of the Month, Interior Design, Kilim stitching patterns, Morocco Stripe Pattern, needlepoint kits. Bookmark the permalink.